This translation has been made for the 2009 UIAA Safety Commission Meeting in order to guide the development of an international recommendation for via ferrate/klettersteig (VF/KS) construction. Neither the technical details nor the accuracy of the translation has been checked. Thus, it would be unwise to use this document as the basis for the design, construction, or up-grade of a via ferrate/klettersteig. There is no English translation for klettersteig. As the English speaking world also uses the Italian phrasing via ferrata, I have translated instances of klettersteig with the abbreviation VF/KS throughout. Klettersteigset also has no equivalent in English. 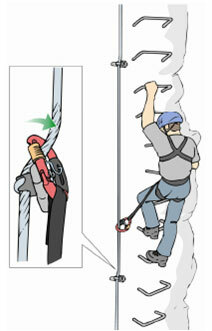 It is the harness and energy absorbing system (EAS) that can safely arrest a climber in the event of a fall on a VF/KS. I have translated instances of klettersteigset with the abbreviation EAS throughout. In general, text in square brackets indicates editorial comment by the translator, including the original wording in the German where direct translation of technical/legal terms is difficult and occasional commentary on the subject matter. viewed as closed to further development. Thus, the new construction of a VF/KS installation requires consideration of the consequences of further encroachment on an already sensitive natural environment. Ultimately, the sustainable development of the region must be the first priority. This priority dictates very stringent requirements on environmental impact, safety, and the ethics and aesthetics of alpine sports. This section covers the range of issues from initial idea to finished installation. This summary introduces the alpine sport, legal, environmental, and business perspectives on VF/KS. This section outlines important considerations for the first phase of planning a VF/KS or of upgrading an existing installation. Next, the definitions of VF/KS and the types of VF/KS installations are presented. Finally, some important rules of thumb are presented for first steps of planning. The mere presence of a wire cable on an alpine path does not constitute a VF/KS. Long tradition and continuing trends have resulted in a multiplicity of different types of cable protected climbs which are independent of the difficulty of any single segment. The following classification ought to provide an overview of the various categories. The classification of any specific climb into one of these categories can be difficult as the categories overlap to some degree. 2. 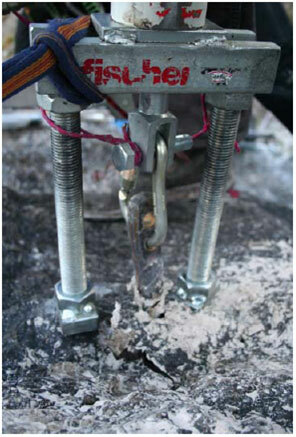 Classical VF/KS Characterized by a continuous fixed cable that protects the climber in the event of an accidental slip. Although generally less steep than sport VF/KS, classical VF/KS require EAS use. 3. Protected Sections Characterized by the absence of continuous cable, the occasional, cable protected sections permit belaying of difficult or exposed moves. The protected sections are often traversed without the use of an EAS. 4. VF/KS Characterized by unmarked (for example by colored blazes) sections of free climbing up to a difficulty of 5.4 (UIAA III). Rock climbing difficulties must be overcome without recourse to cables. Key passages are often equipped with ladders or cable. Communication with all the stakeholders is vital to a smooth construction process and the acceptance of a new VF/KS project. It is imperative to engage these stakeholders in informal discussions concerning the details of the project. Warning: there is significant potential for conflict for any new infrastructure for climbing or hiking; through the initial discussions, this conflict should be acknowledged and minimized. These issues are best addressed before the true planning process where conflict resolution is not optimal; thus the preparation phase is particularly critical. This open communication is a top priority for the installation of a VF/KS and the most important prerequisite for the construction and acceptance of a VF/KS. – In any case, the local community and government agencies (for example, environmental planning or zoning entities) ought to be drawn into the planning at an early stage, especially the in regards to the environmental issues. – If the VF/KS or its approach pass through forestry or pasture land, the installation must be overseen by the foresters or grazers. The mountain sport viewpoint has significant bearing on the installation of a VF/KS, particularly on target users, the frequency of use, and safety. Conflicts with other user groups must be minimized. It must be determined which user group will be targeted for a planned VF/KS. Different user groups have different objectives that necessitate different lengths of climbs, difficulty, variation in the difficulty of different stages, and types of installation. Alpine dangers such as rock fall from other parties or thunderstorms (exposure) are foreseeable and can be kept to a minimum through thoughtful route selection. The same can be said for the specific risks of the approach and descent. The installation of a new VF/KS must not contribute to the destruction or damage to existing routes. When in doubt, build consensus among the stakeholders (see 1.1.2) and balance the importance of the existing route against that of a potential VF/KS installation. Summits that can only be reached by means of technical climbing may not be equipped with VF/KS. 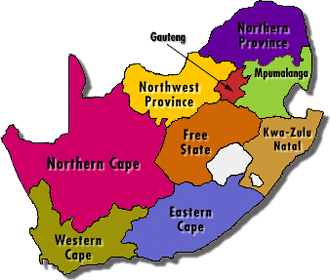 The installation of a VF/KS always requires the written permission of the land owner/land manager. A VF/KS is a construction project that requires a building permit according to the appropriate government or municipal agency. Environmental protection laws must be complied with at all levels, including local, national, and international statutes. The developer/owner/party responsible for the VF/KS takes on the duty of ensuring the structural integrity of the installation and must guarantee regular repair and maintenance. Liability insurance, as currently required for the Alpine Club sections, is also required for VF/KS, wherever any such liability coverage is required. At least once a year (usually at the start of the operating season) and in the event of accident an inspection must be carried out by a qualified person. If serious damage is discovered, the VF/KS must be closed until repairs are made and verified. The installation of a VF/KS may not cause damage or significant impact to the environment. Compliance with species protection laws must be taken into account. A VF/KS must cease operation in the event of the endangerment of a single species or environment. According to the regional, state, national, and international standards, the applicable environmental laws and regulations must be adhered to. A planned VF/KS must be in accordance with every conservation goal. It must be possible to bring a planned VF/KS into compliance. Not only must the VF/KS installation conform to the land use regulations, but other elements and activities associated with VF/KS installation must also conform, including the approach, the descent, and the parking area. It ought to be possible to take public transportation to a VF/KS. In the development of a new VF/KS, the level of infrastructure, in general and for tourist facilities, is critical. Undeveloped areas ought to be respected and allowed to maintain their character. Adequate open space should remain between tourist sites and ecologically sensitive areas. The proximity of available infrastructure and the density of VF/KS in a region must be considered. Summits may not be made accessible through the construction of a VF/KS. It is important to integrate the construction of a VF/KS into the regional development plans. Again, strive for consensus. The installation of VF/KS equipment must be guided by the basic philosophy “As little as possible and as much as is needed.” Elaborate installations, such as zip lines and suspension bridges, should not be added just to add them. Especially in the case of VF/KS located non-mountainous regions, installation in quarries may provide a legitimate alternative to natural cliff venues. The construction of a VF/KS can be employed for the purpose of controlling visitor levels so that undeveloped regions are retain low visitation rates and those regions which are prepared with tourist infrastructure receive the majority of the tourist traffic. In undeveloped regions, no notable tourist attractions may be created. New VF/KS should only be installed where it will be continually used because the installation continues to be an intrusion when it is not in use. As with every type of project, the construction of a VF/KS faces significant financial and organizational challenges that must be addressed head on. Given the concept for the construction of a new VF/KS from scratch or the progressive upgrade of an existing installation, the construction details are of critical importance. For VF/KS, as with all climbing situations, proceeding entails danger. Based on these elements, further recommendations are offered for route selection, basic choice of system with respect to repair and maintenance of existing installations. This section provides concrete recommendations. The results of the research ought to be the basis of plans and calculations. The practical recommendations ought to reduce the amount of repair and maintenance work required of a VF/KS. o Traverses permit the anchors and cables to be laid such that they are under overhangs, roofs, or buttresses where they are to some degree protected from the effects of weathering, e.g. snow loading, icing, rainfall, etc. To design the anchors, cables, and cable connections for a VF/KS, it is vital to evaluation the loads to which the system is subject. Basically, one must evaluate the working load and the maximum load. Working load means the load imposed on the VF/KS due to “normal” climber traffic. This includes gripping and progression while climbing, down-climbing, and resting on the anchors. The VF/KS must be able to sustain this load indefinitely without incurring damage. Thus, the anchors cannot be made from materials that will deform plastically in the anticipated loading range; nor should it be possible for the anchors to loosen or produce excess slack. In the event of a fall, which is a rare event in VF/KS climbing, a significantly higher load will be applied to the structure for a short period of time; this climber arrest load is defined as the maximum load. Plastic deformation is tolerated in the event of the application of a maximum load; however, material failure, such as breaking an anchor, is not permitted to occur under maximum load. In addition to the working load and the maximum load, especially in winter or early spring, one must contend with the snow load and rock fall impact which can easily add up to several tons. These loads must be addressed in the planning stage (through swapping out affected elements or route choice), as it is unrealistic to build an entire installation that will be impervious to snow loads and rock fall impact. The application of a load to a wire cable, as shown in Figure 1, results in an amplification of the force on the anchors due to the perpendicular redirection of the applied force along the direction of the loaded cable. The amplified anchor force is significant and must be taken into account, especially on traverses, but it is also relevant on rising traverses. The order of magnitude of the force amplification can be calculated and taken into account in the construction plans. The second term in Equation 1 represents the amplification factor. For example, when calculated according to Equation 1, a 4 m span that droops 20 cm under load has a force amplification of 5. A 30 cm droop results in an amplification of 3.4. Table 1 shows the calculated amplification factors for a 4 m span for droops between 5 cm and 40 cm. Consider anchors separated by 3 m and a climber with a weight of 80 kg who hangs so that the cable droops in the range or 10 to 20 cm. This situation produces an amplification factor in the range of 7.5 to 3.8, according to Equation 1. Reducing spans and increasing droop has a positive effect on (reduces) the loading of the anchor points. The calculations have been tested against experimental results in a sample installation which was outfitted with multi-strand cable [Litzen-Drahtseil] and the calculations suffice only for a first order estimate. The results are shown in Figure 3. The measured droop under load for the light pre-loading ranged from 10 cm to 30 cm and the droop of the highly pre-loaded setup ranged from 5 cm to 15 cm. The tension in the cable is an important factor in determining the load on an anchor and significantly increases the force applied to the anchor. After determining the force amplification, we sought to characterize the loading due to normal progression along a VF/KS, for example hanging on cables and resting on the anchors. To do this, we dangled from a traversing cable and winched up the cable. The load imparted by the climber ranged from 0.5 to 1.5 times body weight—an 80 kg climber would load an anchor in the range of 0.4 to 1.2 kN. A nominal loading of 1 kN (100 daN) can be assumed. A load that a VF/KS climber would exert in the manner outlined in 2.2.1.2; this load lies in the range of 0.5 to 1.5 times body weight for elements that are not significantly pre-loaded. Nominally, it can be taken to be 1.0 kN. For preloaded spans, expect a loading of 3.5 kN at the anchor point due to a progressing climber. Extra care must be taken for VF/KS with pre-loads as experiment suggests that a force amplification of 6 is possible in the event of maximal loading. The load due to climber progression must be born by the VF/KS without causing deformation that would lead to fatigue of the anchor points. The progression load for cable without pretension is nominally 3.5 kN and for pretensioned cable it is 6 kN. On rising traverses and steep sections, a fall arrested by deployment of a UIAA/CE EAS results in a maximum load of 6 kN, which is the maximum permitted by the standard (EN 958 & UIAA 128). This 6 kN load must be taken as the maximum load that can be applied to steep sections. The anchor may undergo plastic deformation under the application of loads in the range of the maximum load as the load duration in the plastic region is not long. Although loading of traversing sections produces force amplification (2.2.1), fall arrest on a traverse is not an issue as the EAS will not reach its threshold for deployment, In this situation, the maximum load of 3.5 kN for cables without pretension and 6 kN for pretensioned cables suffices. For the construction of VF/KS, these results distinguish between sections that must sustain high loads on account of elevation gain and the possibility of a fall and “handrail” sections that traverse and obviate significant falls. The load bearing anchors can be divided into terminal anchors and intermediate anchors. These are different from the handrail anchors. o The eastern alps or classical system which allows the cable to run freely through the eyebolts; classical systems may employ tensioned or untensioned cable and the cable may or may not be clamped at the anchors. (Figures 5 & 6). The influence of the VF/KS system type (French, classical, tensioned, untensioned) and the types of anchors on the impact strength of the VF/KS carabiner has been the subject of a research effort by the German Alpine Club. The results of this research indicate that the type of construction has significant effect on the loads imparted both to the anchors and to the VF/KS belay carabiners. 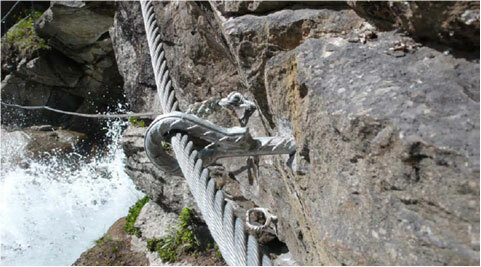 Some attachment is needed to fasten steel cable to the cliff. In the following, such attachment is referred to as “anchor.” Anchors, in combination with cable, are the central construction elements of a VF/KS. In this section the different considerations of the selection of anchor types, their construction (material and geometry) as well as their installation are covered in detail. To serve as examples, calculations and experimental measurements are provided by the German Alpine Club. In general, there are two categories of anchors: eye bolts and clamp anchors. Clamp Anchors: In contrast to eyebolts, the cable in a clamp anchor (flag anchor/flat clamp anchor [Fahnenanker] or bracket clamp/U-clamp anchor [Bügelklemmanker]) is constrained by the clamp. For end anchors, eyebolts or glue-ins are used. Alternatively, the cable ends can be glued into the cliff an appropriate distance (compare also 2.4.3.1). Cable diameter determines the depth of the hole required for the cable clamp anchor. The use of industrial grade anchors is strongly recommended. Do-it-yourself welding introduces an unnecessary source of danger. The ability of the anchor to sustain loads depends on the anchor design and the type of VF/KS construction. Accordingly, the German Alpine Club has measured the semi-static breaking strength of different types of VF/KS carabiners. We tested eyebolts and U-clamp anchors (smooth forged clamp anchors), straight and angled, in untensioned and tensioned systems as well as the French loop construction. For flat plate clamp anchors, the manufacturing cost was a problem due to reduced values from embrittlement during welding and for this reason they have been omitted from this study. 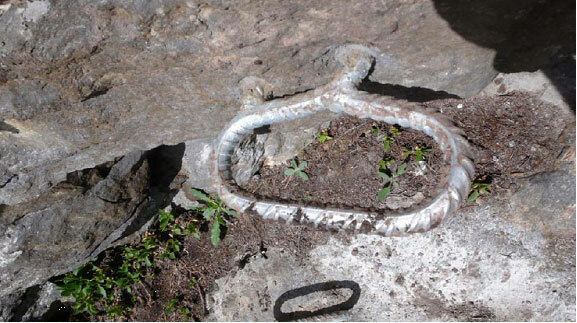 In this investigation, the unfavorable loading of VF/KS carabiners was undertaken in order to determine the influence of the system on the results. Tested were the U-clamp anchor with 14 mm, lightly tensioned cable and 12 mm pretensioned cable. In this investigation, a loading direction perpendicular to the loading axis (carabiner spine axis) is considered the worst case loading direction from which trends can be extrapolated. The results of the tests of different pretensions shows that a lightly pretensioned system allows some play in the cable so that the carabiner is not truly loaded in a bending mode; similarly, a very high varience in the peak load occurs in pretensioned systems with a resulting, alarmingly low strength. The further investigation of the carabiner strength according to different anchor types and cable systems was carried out in the unfavorable loading configuration to the degree that this was possible (see Fig. 8). The experiment matrix took into account the difference between eyebolts and U-clamp bolts, straight and angled, and the French loop construction system and the classical system with different cable pretensionings. The results show an average carabiner strength of 19.0 kN for untensioned cable and 14.6 kN for tensioned cable, whereby alarming rupture values occurred in the range of 6 kN. o The effects of the cable outweigh those of the anchor type; there is no significant difference in carabiner strength due to any anchor type. o The important aspect of loading is a small amount of pretension (French system or classical system without pretensionings); pretensioned cable can significantly reduce the breaking strength of the carabiner. o •The differences in carabiner strength between the French system and the un-pretensioned classical system are negligible, and the high variance is not practically relevant. o Untensioned or lightly tensioned systems are recommended—construction according to the French system or the classical/east alp system with U-clamp anchors and light tensioning. The materials appropriate for use in cable anchors are rebar steels that conform to EN DIN 10080 (Standard for ribbed construction steel [rebar], the ribbing is important for the bonding agent [glue]) quality class 500S (high strength and weldability). Further, a protective corrosion coating is recommended, for example Zinc or Chrome—otherwise the cliff fills up with rusty nubs. The use of expensive stainless steel is only important for anchors that are not subject to snow loading or rock fall and thus do not need to be swapped out. In most cases, oversizing the anchor is not an acceptable method of protecting against corrosion. In general, there is a distinction between high strength sections, for example anchor points of vertical sections subject to the possibility of fall arrest, and traversing [handrail] sections. The force requirements are further distinguished for end anchors and intermediate anchors. In contrast, the traversing anchors are distinct. These are all the anchors that fix the ends of the cables. As the failure of an end anchor would have fatal consequences, and they are often used as belay stance anchors, the climbing anchor standard is used: a breaking strength of at least 25 kN in the radial direction and 15 kN in the axial direction. These are all the anchors that lie between end anchors in high strength sections. Traversing anchors are anchors in traverses where there is no possibility of falling any distance. They can be found between end anchors, for example between two corner anchors. The important characteristic is that no fall arrest loads can be applied. Further, in order to prevent unfavorable leverage of progression loads, a thinner (handrail) cable can be used. 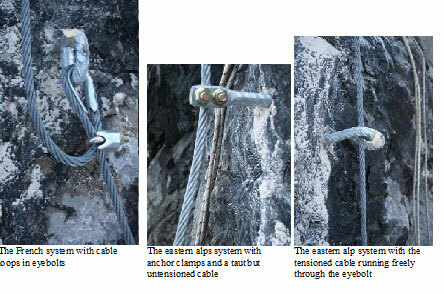 The use of U-clamp anchors, for example with the French system, allows the cable to be fixed to each anchor point. In the event of a fall, should the loading result in the failure of an anchor, the next anchor can take the load. This system is more or less redundant against anchor failure. Thus, such systems can be constructed with a nominal progression load of 3.5 kN without any additional safety factor. When using eyebolts through which the cable is freely threaded, each anchor must be sufficiently strong to be able to sustain a fall arrest. A load of 6 kN must be withstood without deformation sufficient to damage the material. Further, the loading angle for pretensioned systems is significantly unfavorable (see 2.2.1) and thus the importance for tensioned cables that there are no burrs in the eyebolts that lead to degradation of the cable. The pretensioning should be reduced to a maximum of 4 kN. For all high load anchors, the climbing anchor requirement is recommended, 25 kN radial and 15 kN axial. The force application point occurs at the contact between the cable and anchor, whether eyebolt or clamp (see Fig. 9). At this point, a progression load should not cause plastic deformation that could lead to anchor failure. Fig 9 The force application point lies at the contact between the cable and the anchor In principle, the sizing of anchors is done according to the anchor classification outlined in 2.4.3: end anchors, intermediate anchors, and traversing anchors. Fundamentally, end anchors lack redundancy. To counter this lack of redundancy, the end anchor requires a fundamentally higher safety factor. They should be sized according to the intermediate anchors of a pretensioned system (6 kN) so that material degradation does not result from plastic deformation due to fall arrest. This situation requires that the anchor be mounted flush with the wall to reduce the lever arm (Fig. 10). 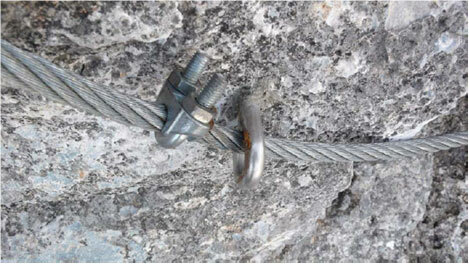 Further, end anchors must take on the rating of climbing anchors: 25 kN radial & 15 kN axial. 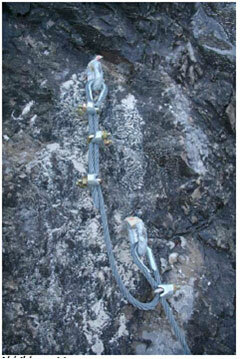 Fig 10 End anchoring with minimal lever arm (left & right); the direct fixing of the cable to the cliff shown in the middle figure is indeed sufficient though obviously the cable cannot easily by swapped out. According to bending tests of the German Alpine Club, the relationship between the anchor diameter and lever arm is important. Measurements were carried out on anchors of galvanized construction steel StE550 (EN DIN 10326/EN DIN 10143) with an ultimate stress (Rm) of 620 N/mm2 and a yield stress (Re) of 550 N/mm2 (source: mfr. Shiestl). These values are used in the following example. The maximum bending stress is distributed on the outer surface according to Equation 2. The torque and for a circular cross section, the bending moment is . We take the bending stress, σb, to be the yield stress, Re; in general, the bending stress is smaller than the yield stress, so the result represents a maximum lever arm (Equation 3). The lever arm calculated according Equation 3 is proportional to the yield strength of the material which provides an acknowledged safety factor with the assumption that the material is within its elastic deformation range. In an experimental rig, the plastic and elastic deformation of different anchors was measured as a function of applied load. Figure 12 shows photos of the testing at loads of 3kN and 6kN. The load is applied to an anchor with a cross section diameter of 16 mm and a lever arm of 220 mm. Table 3 lists the loads and the resulting deformations, for example a total deformation of 50 mm due to a 2.5 kN; the elastic deformation is 13 mm and the plastic deformation 37 mm. Consensus on the correct lever arm distance and anchor length turns out to be most difficult. A simple method is to provide an example of an appropriate stand-off. The stand-off length and anchoring depth are covered in detail shortly. If one takes the steel properties outlined above (STE 550), the results of Equation 3 are given in tabular form in Table 4 and show the relationship between stand-off distance and diameter. These values are provided for different loading situations: the handrail anchor and the intermediate anchor for an untensioned system (F1) and for the end anchor and intermediate anchor in a tensioned system (F2). For example, an anchor with a diameter of 20 mm according to Table 4 and Figure 13 can, used as an intermediate anchor (loaded with F1=3.5 kN in an untensioned system), stick out from the wall at most 123 mm. In a tensioned system, the stand-off distance is only 72 mm. In this range of forces, the loading is sure to be well within the elastic range of the material. With the help of Equation 3, the maximum stand-off distance can be calculated for a given steel and diameter; conversely, the minimum diameter can be determined for a given stand-off distance (Equation 4). For the press-fits, friction bonds the anchor to a precisely dimensioned hole. For glue-ins, a bonding agent is used that can handle the loading, and the recommended installation instructions dictate a 2-3 mm gap around the anchor. Glue-ins: Using a bonding agent, 16 mm anchors were glued in 20 mm holes and 20 mm anchors were glued in 25mm holes. The pullout strength was measured in the axial direction with a hydraulic tensile tester (Figure 14). For press-fitting, whether the anchor is surrounded by bonding agent is not a deciding factor. The only effect of bonding age use is the requisite widening of the bore. For anchor fixing on cliffs, both glue-in and press-fit fixing techniques are appropriate. Inappropriate techniques include the use of construction cement or fast setting cement because cyclic loading will eventually fracture the cement and the anchor will fail. The insertion depth depends on diameter and anchor type (stand-off distance) as well as the rock quality (Table 5). For bonding agents, recommended are all industrial/construction 2-component epoxy or polyester based agents approved for the loading range. • Press-fitting: For friction based anchoring, the hole diameter must be that of the anchor. • Glue-ins: For a glue-in, a 2-3 mm space between the anchor and the hole is appropriate. The distance between anchors in high-force sections should be less than 4 meters, measured as a vertical distance (Figure 15). For end anchors and the first intermediate anchor, it is recommended to reduce the spacing further (as shown in Figure 15) to prevent the danger of groundfall. Fig 15 Schematic diagram of a fall on a VF/KS. The separation of anchors should not exceed 4 m, and groundfall should be prevented. In low-angle sections, the anchor spacing should not exceed 5 meters. For rope spans over chasms, suspension bridges, or zip-line installations, the spacing should not exceed that of 10 times the maximum sag under an 80 kg load placed at the midpoint of the span. For the construction and upgrade of a VF/KS, it is important to use the same anchor fixtures throughout the installation. Only the end anchors can differ from the rest. This allows the quick swapping of “matching” anchors and simplifies repairs. In order to use a cable eye stiffener, one must correctly dimension the eye to be 3-5 mm wider than the cable diameter. If the anchor eye is too large, the cable will rub eventually wear through (Figure 18). For end anchors, it is practical to use larger eyes in order to accommodate two cables, possibly with eye stiffeners. 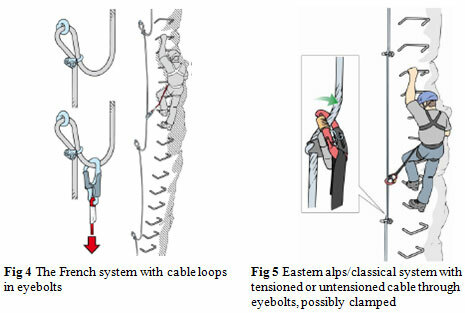 At intermediate anchors, it is recommended that clamp anchors be used to constrain cable rubbing, as the anchors are degraded by the contact with the cable (see Figure 17) and a wearing through of the anchor eye is always possible. It is best to avoid ribs or burrs in the eye, which should be smooth to protect against cable degradation (see Figure 16). Different cable diameters require different anchor dimensions and clamping geometries. Provide pictures of no-goes, for example, short cuts etc. 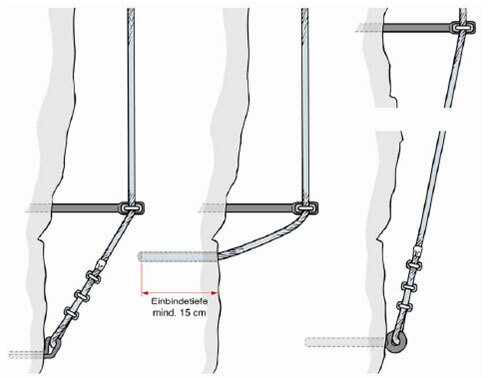 Fig 16 Rebar eyebolt in a classic east-alps tensioned installation. The inner surface of the eyebolt is smooth and free of burrs. Fig 17 Cable clamps on either side of an intermediate anchor limit wear. Fig 18 Friction wear of eyebolts. Cables, along with the anchor points, comprise the most important parts of the VF/KS. In this section, the selection of cable and its dimensions according to the connection opportunities is described. Later, the resulting implications for repair and maintenance are described (-> 2.7). A further aspect that is address in 2.5.3.6 is that of rubber bands. Many types of cable are available on the market, but of course all are not appropriate for use on VF/KS. The main categories of cable are spiral cable [Spiralseil] and stranded cable [“laced cable”: Litzenseil]; only the stranded cable is appropriate for VF/KS. Spiral cable conforming to DIN 3052 and DIN 3053 is quite stiff and slippery. Further, in spiral cable construction it is difficult to prevent the breakage of individual wires (-> 2.7.1.1). Because the individual wires of the spiral cable that lie on the outside surface do so for the entire length of the cable, any outer wire that breaks will unravel the entire length of the cable unlike the stranded cable in which the individual wires unravel around the strand axis and into the middle of the cable. Stranded cable conforming to EN 12385-4 (for example, DIN 3060: 6×19 = 6 strands, each with 19 wires and DIN 3055: 6×7 = 6 strands, each with 7 wires) are relatively flexible and graspable and are recommended for VF/KS construction and are only a little more expensive that the spiral construction cables. In the construction of stranded cables a single wire in the strand will alternate between the inside and outside of the cable (the construction of stranded cable is shown in Figure 19). Thus, the severing of a single wire is compartmentalized and the unraveling is prevented without recourse to the use of rubber bands (-> 2.7.1.1). Stranded cable is available in different materials for different applications. Only materials with low susceptibility to acidity that dry quickly are recommended. Steel cable is available with different diameters of the individual wires. The choice of wire diameter is a trade-off between handling (thick wires result in stiff, slippery cable) on one hand and cable degradation (thin wires result in high corrosion rates and susceptibility to mechanical damage) on the other hand. The DIN 3060 or DIN 3055 stranded cable represent a reasonable compromise. Important to cable selection is the corrosion resistance. (Hot-dipped) galvanization is recommended. The use of stainless steel cable may not be called for on account of its high price and the need for swapping cables out, especially in sections subject to snow loading and rock fall. For other special plastic cable coating options available on the market, the same recommendations apply as to rubber bands (-> 2.5.3.6); these coating allow moisture to collect between the coating and the steel and promote corrosion. PVC, the most common plastic, has very low tolerance for mechanical damage and fatigue, and thus such coatings represent an additional failure mechanism. Often the damaged spot is patched with a rubber band and the corrosion problem is exacerbated. Further, coated cables are quite expensive. Fundamentally, the VF/KS should be constructed with a single diameter of cable on the grounds that the single diameter determines the anchor geometry and the sizing of all additional equipage, including eye grommets, shackles, turnbuckles, etc. For the dimensioning of the cable thickness, differences in section difficulty can be taken into account (handrail vs. high strength sections). The recommended cable diameters are shown in Table 6. Slack cable is only recommended when it is fixed to each anchor point. When using eyebolts and free running cable, the cable should be tensioned so that an 80 kg loading does not cause the cable to wear in the eyes. In general, the pretension should be limited to 4 kN. 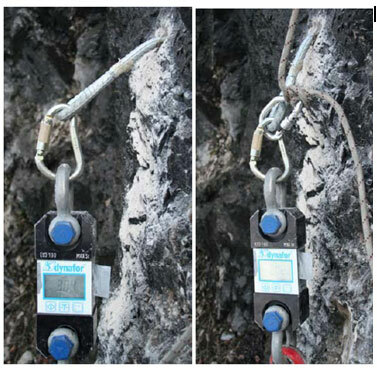 For tensioned cable, the contact with the cliff must be kept to a minimum on account of both accelerated abrasion of the cable due to rubbing and difficulties imposed on the climber, both for moving the belay along the cable and in the event a fall when the contact point may interfere with EAS deployment. In general, it is preferable to fix the cable to every anchor. For the construction of VF/KS, only cable clamps tested according to EN 134M-5 (DIN 1142) should be used. For the securing of end anchors, three clamps are in order. Here the U-clamps must be placed on an unloaded cable section downstream of the loaded cable ends. The first clamps should be installed directly behind the eye grommet/stiffener to prevent the ripping out of the grommet. Freely protruding grommets present a risk of injury and can be mistaken as anchor points (two such fatal accidents are known). The minimum separation between the clamps is the clamp breadth (Figure 20). Further, the adoption of bolt protection caps is recommended to reduce the danger of injury. This is required along the full length of the threaded bolt section and can be easily produced at home or in a workshop. Without such protector caps, one can seriously scrape on the screw threads and nuts. It is a well known accident in which VF/KS climbers incur serious lacerations that could be reduced with protector caps. Often a grommet is used to fasten a cable loop to an end achor as shown in Figure 20/21. Here it is important to use the correctly sized grommet. The grommet should protect the cable from the anchor point both by providing mechanical protection and by reducing fatigue by providing a constant bend radius under loading that protects against nicks in the cable. For assembly, open, unwelded grommets are employed because they can be threaded through the eyes. For bending the grommet, a special tool is required and is recommended for preparation at home or in the workshop according to the easiest good plan. The use of grommets entails the danger that the grommet will separate from the cable loop in which case it can be misused as an anchor point (two fatal incidences of this accident type are known). At different places, for example with the use of turnbuckles with eyebolts, quick links must be employed. 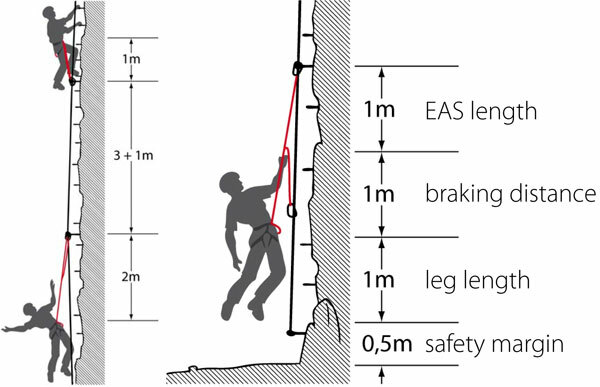 Basically, quick links are not recommended as they reduce the belay distance. Galvanized quick links that conform to EN DIN 82101, Form A, which is also satisfied by the carabiner standard EN354, should be used. Quick links are always subject to coming unscrewed which must be prevented by: 1) denting the threads with a hammer and punch or 2) threading and tensioning a safety wire through a hole drilled in the threads. Insert image of measure against unscrewing! Turnbuckles are important for the classical, east-alps construction method with tensioned cable through eyebolts. Turnbuckles available on the market fall in two different categories: tube turnbuckles and open turnbuckles [Rohrspannschloss und offenes Spannschloss]. 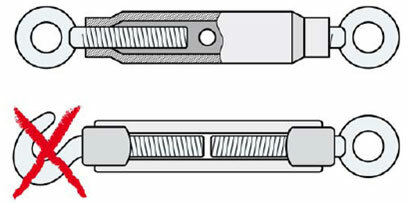 Tube turnbuckles according to standard EN DIN 1478 (Figure 22, top) are constructed of corrosion resistant steel and are recommended (and expensive). Of course moisture can collect in the tube and lead to enhanced corrosion that cannot be perceived from the outside. Of these types, only the jaws (fork/cotter pin) mounting is recommended [but not shown in Figure 22]. Hook mounting is generally not secure enough for use in VF/KS construction. With eye mounting, there is the problem of reduced belay spans on account of the inherent extension introduced by quick link use. The entire cable connection should be as short as possible to minimize interference with the belay carabiner on the climber’s EAS. It is important to include the length of the three end clamps in the total length of the turnbuckle installation which will be at least a half meter that the climber will have to bridge. If one is hanging two cables from a single anchor point the total adds up to a meter. This may be reduced with two end anchors that are offset. With the recommended jaws connection, the quick links are superfluous and the failure by unscrewing need not be employed, either by punching the threads or by placing a wire through the threaded shaft (-> 2.5.3.3). In general, turnbuckles must be prevented from working themselves loose. The best method is the placement of the wire through a hole bored in the shaft, though this wire too can come undone. Another option is to fix the middle turnbuckle piece in place with wire. A winch will be needed to tension cables more than is possible with the limited range provided with a turnbuckle. The tension force is applied with a winch at a tensioning clamp placed near where the cable will be clamped to the anchor/turnbuckle as shown in Figure 23. As noted above, the tension should be limited to 4 kN. 5. connect the cable grommet to the turnbuckle in the fully extended position (for jaws connection turnbuckles); for eye connection turnbuckles, either thread with a quick link or a grommeted rope loop. The cable ends are furnished with end caps, which must be applied with a special crimping tool, and prevent fraying of the cable ends. The application of rubber bands is not professional will quickly result in rust and fraid ends. Corrosion is an important issue for VF/KS cables because they are rarely made of corrosion resistant materials due to the high cost of stainless steel. In general it can be assumed that corrosion presents a danger as it is known to halve the strength of uncorroded cable. On account of this strength reduction, rubber bands are particularly risky to apply. Most rubber bands are applied with good intensions to repair a frayed cable and prevent injury by the broken wire. Damaged cables can be repaired without the use of rubberbands as shown in section 2.7.1.1. In need, application of rubber bands is permitted at the unloaded cable ends in place of end caps. The cable becomes wet on account of precipitation, clouds, and condensation, and the humidity builds up in the space between the rubber bands and the cable. Depending on the weather, the cable dries again, except under the rubber bands, where the humidity collects. This area draws in liquid by capillary reaction and maintains a moist microclimate [that is enriched with salts and/or acids]. This situation greatly exacerbates the corrosion rate and, undetectable from outside, the cross-sectional area of the cable becomes greatly reduced and is no longer trustworthy. In the event of loading the cable will sever unexpectedly. Insert pictures of does and don’ts here. As progression aids can in general also be used as belay anchor points, they must satisfy the climbing anchor strength, a fracture strength of 25 kN (radial) and 15 kN (axial). Progression aid should not allow children’s feet to fall through and get caught. Progression aids should be free of burrs and sharp edges [all edges…which the user or the EAS might come in contact with must be burr free,” from EN 12275, section 4.41.1 for carabiners]. Further, all progression aids should have rounded forms to minimize the risk of injury: no spikes and no tread plate. Foot holds should only take the form of foot pedals as shown in Figure 26. Spikes or plates are not recommended on account of the danger of injury. The maximum a foot hold should protrude is 15 cm. As for anchors, use galvanized rebar steel (the ribbing is important for gluing) according to DIN EN 10080 (standard for rebar construction steel) of the quality class 500S (high strength & good weldability). Even so, corrosion protection must be attended to. The least amount of protrusion is desirable as it reduces the influence of snow loading and increases the lifetime of the foothold. The diameter is addressed in 2.4.3.2. For breadth, 20-30 cm is recommended for both feet. Important: Footholds can be used as belay anchor points and must be of sufficient strength (as for end anchors and climbing anchors). In order to reduce torque, the foot hold should be fixed to the cliff by two dowels. In general, the repair and maintenance of VF/KS is should be carried out before the opening of the facility at the beginning of the climbing season in order to take care of damaged and defective sections. The inspection is best conducted by qualified, technical people, perhaps with the help of others. Best practice includes documentation of the damaged sections with photographs in order to be able to plan the clean-up from home/the office. The most damage is caused by snow loading and rock fall. The most common is fraying cable. These issues are addressed in more detail in the remainder of this section. o In general, traverses and diagonal sections present larger surface areas to snow loading than steep sections. o Steep sections are more protected than flat slabs. o Gullies and chimneys should be avoided as these locations present the most common location of damage and present the greatest challenge to protecting the VF/KS installation against rock fall and snow loading. 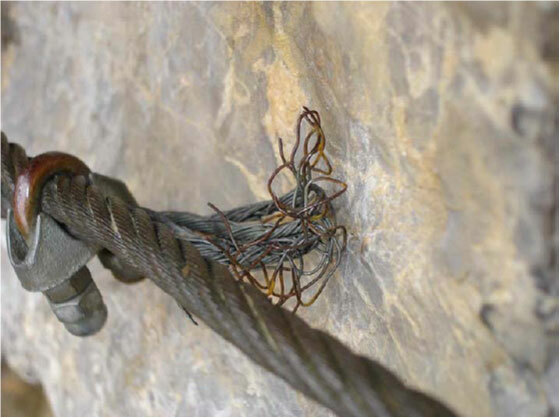 o For tensioned cable, avoid contact with the cliff: the cable is easily damaged by rubbing on the cliff and the contact point increases the likelihood of hanging up the EAS. o If one must alter the cable route, pay attention to lightning danger. Do not connect sections directly, but offset them (by no more than the meter that the EAS can span. Often, damage occurs to the cable, especially splaying at the ends and broken wire strands. This problem is addressed in this section. Rope ends should always be protected against fraying by the application of end caps as outlined in 2.5.3.5. Application of rubber bands is permitted, but only for unloaded cable ends and only as a temporary solution. If one discovers broken wires in a cable, the cable must be promptly repaired on account of loss of strength. Mostly, this task is very difficult to implement. The break of a single wire does not significantly reduce the strength because of the safety factor built in to the cable diameter and thus a repair [of the single, broken wire]is possible based on technical safety considerations. This task is generally more easily accomplished with stranded cable than with the spiral cable (which is not recommended anyhow). o •Stranded cable: As described in section 2.5.1 a broken wire in stranded cable can be simply broken off. Cut the wire short—1 or 2 cm—and bend it back and forth along the direction of the cable until it breaks at a point inside the cable and does not stick out. This is no problem for wires up to about 2 mm in diameter. o Spiral cable: The fixing of a broken wire in spiral cable is generally more difficult than in stranded cable, and thus the application of this technique to spiral cable is not to be recommended. 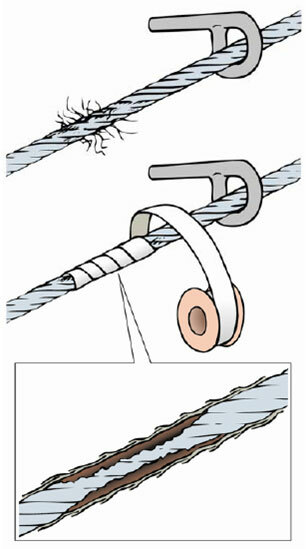 Two methods are possible for tending to a break of a single wire: either 1) wrap the wire around the cable until it does not present further danger—which is very difficult to do with thick wire or 2) unwind the wire from the cable until it reaches the end of the section and cut the wire short enough that it won’t poke out of the cable. Cutting cable is conveniently managed with a battery powered rotary grinder [axel grinder/Winkelschleifer ]. The rolling out of the cable from the spool is important. The cable should be unwound from the spool like a carpet is unrolled (or a new climbing rope). Otherwise [when taking the cable off of the side of the spool] the cable is damaged and tends to kink. Insert pictures of unrolling cable! At these times, an organized, documented inspection should be carried out by a qualified person. After sustaining significant damage, the VF/KS must be shut down and the damage must be immediately corrected. A qualified person is one with appropriate construction experience or technical knowledge. The signage for VF/KS can be standardized, for example, the required equipment, the requirements, etc. Also, unusual dangers must be indicated. The difficulty of a VF/KS ought to provide an impression of the difficulty of the entire course appropriate to the installation. Difficult and very difficult climbs can deter unprepared climbers through a difficult or crux section at the very start. The difficulty of a VF/KS ought to be rated according to recognized scale (cf. the five tiered Hüsler-scale). In general, by agreement, easier VF/KS are preferred in remote areas where VF/KS are uncommon. The possibility of retreat should be built into every type and difficulty of VF/KS. This summary is not intended as a substitute for the complete standard. It is intended to give an idea of the requirements for Via Ferrata energy absorbing devices and to help convince climbers of the need to use the correct safety equipment when using a Via Ferrata. What is the total investment on average.